Good air is a factor in your quality of life, especially in enclosed rooms. Schools in particular have special requirements when it comes to ventilation. TROX offers perfectly tailored air conditioning (air conditioning systems and ventilation systems) for optimum ventilation in schools. At present, there are about 40,000 mainstream schools in Germany, many of which are in need of refurbishment. Energy efficient refurbishment of schools allows municipal authorities to cut their energy consumption and save money in the long run. 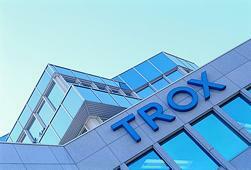 Air conditioning from TROX can reduce a school's energy requirement by 70% on average. Decentralised ventilation units from TROX are available in various construction styles and with various equipment features – from a simple construction to a comprehensive multifunctional device. All devices have been tested in practice for years. Under sill units are particularly suitable for use in refurbishments; they can be installed under the windows or in the window casements. With its extensive product portfolio, TROX offers the most advanced technological solutions to create the best possible conditions for a healthy environment and efficient learning in schools and universities. 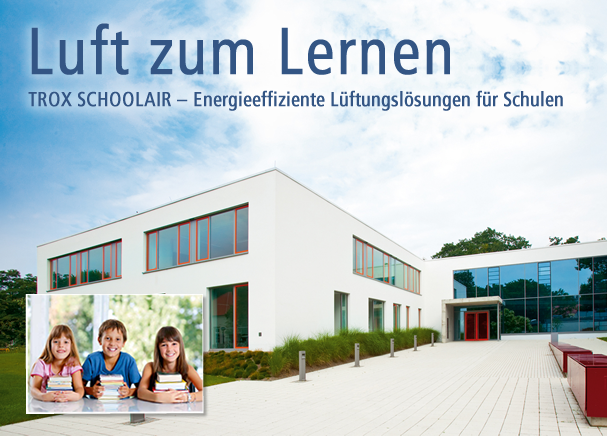 TROX SCHOOLAIR is the perfect solution for schools - energy-efficient ventilation solutions tailored to classroom needs. At present, there are about 40,000 mainstream schools in Germany, many of which are in need of refurbishment. Energy efficient refurbishment of schools allows municipal authorities to save a great deal of money in the long run. Half of the annual energy costs a municipal authority has to pay can be attributed to the schools. Energy efficient refurbishment can lower the energy requirement of a school by 70% on average. This opens up a massive savings potential for municipal authorities, which considerably relieves the budget year after year. The replacement of façades and windows improves the imperviousness and heat insulation of the building envelope and makes a mechanical ventilation of classrooms absolutely necessary. Otherwise, a danger of mould is not the only threat in case of insufficient ventilation. The air quality in particular can sink dramatically in classrooms occupied with up to 30 pupils. In city centres, EN 13779 requires a CO2 concentration of 1,200 ppm above the content in outdoor air as the standard value for a low room air quality (IDA 4). Higher concentrations lead to a drop in performance, headaches and indisposition. A bad indoor environment means a bad learning environment! 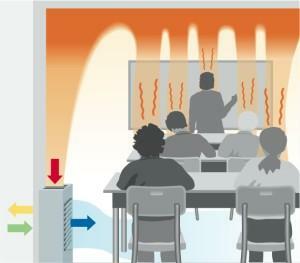 Classrooms place high demands on supply and extract ventilation. They are sometimes used extensively with up to 30 people. A fresh air flow rate from 15 to 20 m3/h is usually assumed for each person. This results in an overall volume flow rate from 300 to 600 m3/h per classroom. To achieve an optimum air distribution, the supply air should preferably be supplied to the room at a minimum of two points with a displacement flow. In the case of a construction with a heat exchanger unit, the devices are efficiently supplied with water as the energy transfer medium. Decentralised ventilation systems are very flexible. They can be regulated for individual rooms and specific requirements, thus minimising operating costs.